Museum campus design concept. 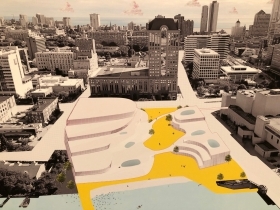 Rendering from UWM Marcus Prize Studio. What would a joint facility look like for the Milwaukee Public Museum and Betty Brinn Children’s Museum? 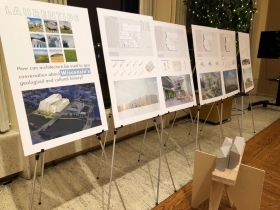 UW-Milwaukee architecture students, under the guidance of internationally-renowned architect Jeanne Gang and UWM professor Kyle Reynolds, presented site-specific plans at a reception held today at the Marcus Center for the Performing Arts. 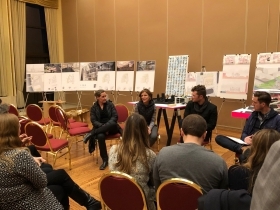 The plans, the result of a semester-long design studio, were focused on a block bounded by E. State St., N. Water St., E. Highland Ave. and the Milwaukee River. The site, currently occupied by the Marcus Center for the Performing Arts parking garage and a floral wholesale warehouse, would be cleared with a shared facility rising in their place. 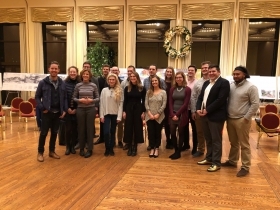 The students, who worked in pairs, exhibited their work to a jury led by the Chicago-based Gang at an event held Wednesday at the Marcus Center. 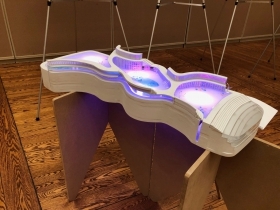 Gang, whose Aqua tower in Chicago is the tallest building in the world designed by a woman, asked questions and critiqued the projects alongside other jurists including stakeholders from both museums. She noted the many challenges the site has, including the need to replace the current parking on site and the difficulty in connecting the new facility across E. State St. with the performing arts center. She also praised the students for seeking to engage with the river and create a cultural center for the city. “I really liked working with the students because I learned about Milwaukee through your projects,” she said in a speech after the critiques. Students had the opportunity to work in Gang’s Chicago office as part of the effort. “It’s super challenging to have a real project as a student,” said Gang. 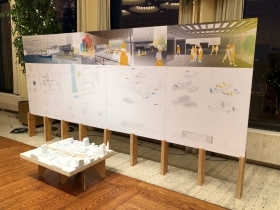 “This studio asked a lot of students.” And while the student designs won’t be built exactly as is, the UWM studio program has a history of kickstarting real-world action, including the demolition of the Park East Freeway, redeveloping the inner harbor and the creation of O’Donnell Park. Designs ranged from traditional box structures to creative designs that embraced the area’s natural history. Designs and models included everything from new pedestrian bridges to a concept that could be converted from parking to future museum space. See the plans in the gallery below. Participating students included Tyler Weis, Jordan Felber, Gabrielle Fishbaine, Brodie Kerst, Kim Workman, Tia Milkova, Britiani Bahr, Patrick Osowski, Ben Schenck, Enrique Mendoza, Cierra Schmidt, Jon Barac, Natalie Campbell and Jack Grover. Gang, who leads her namesake Studio Gang Architects, fits the program’s goal and more. The Gang-designed Aqua tower (82 floors, 859 feet) opened in 2009 near Millenium Park in Chicago and features a unique, wavy exterior that mimics the limestone outcroppings found on nearby Lake Michigan. But she’s not standing still. Just a few blocks from Aqua, Vista Tower is under construction. When it’s completed in 2020, the tower will break Gang’s own record of tallest building designed by a woman, measuring a planned 1,191 feet (93 floors) in height. Gang also has projects underway in New York, San Francisco and St. Louis. Her first building in Wisconsin, the redevelopment of a powerhouse in Beloit for Beloit College, will open next year. But David Marcus, who leads Marcus Corporation Foundation and Marcus Investments, doesn’t want it to be her last. “If we had a Jeanne Gang building in Milwaukee that would be a wonderful end goal,” said the businessman and philanthropist. Could it be a new museum campus? Time will tell. The campus plan released last week for the Marcus Center is likely to come to life before any new museum. Marcus Center president Paul Mathews told Urban Milwaukee: “They’re in essence two separate projects.” But Mathews acknowledged a new parking structure has long been desired, and the concepts offer a lot of promise. He said that the potential for two new museums to move in next door, and the Marcus Corp‘s redevelopment of the Intercontinental Hotel into the arts-oriented Saint Kate Hotel to the south could create a cultural campus in the heart of the city. The first visible changes to the Marcus Center should be done by next fall according to Mathews, in time for the facility’s 50th anniversary. He said exterior work will start first, including replacing the glass facade on the building’s eastern side with a less tinted material. Part of the long-term exterior changes will include a reconfiguration of the gardens designed by landscape architect Dan Kiley. “We have heard from people we need to make a more accessible space,” said Mathews, while adding that Kiley’s tree arrangement is currently not so. In total, the director said 30 percent of the grounds are not ADA-compliant. The vision, according to Mathews, is to maintain the grid central to Kiley’s design and plant a number of mature trees on its perimeter, while creating more exterior space. The master plan was designed by HGA. The interior of the center will also see plenty of changes in the coming years. “We are doing over 2,300 events a year in here, so we need more space,” said Mathews. He said much of that will come from repurposing existing space, but that will take time as much of the work needs to be done in the summer to avoid the fine arts season. Additional fundraising work still remains on the entire Marcus Center project. As for work on a new joint-museum, much remains to be done. The Milwaukee Public Museum has been looking to move for years, but the organization is currently seeking a new president in the wake of the sudden resignation of Dennis Kois. 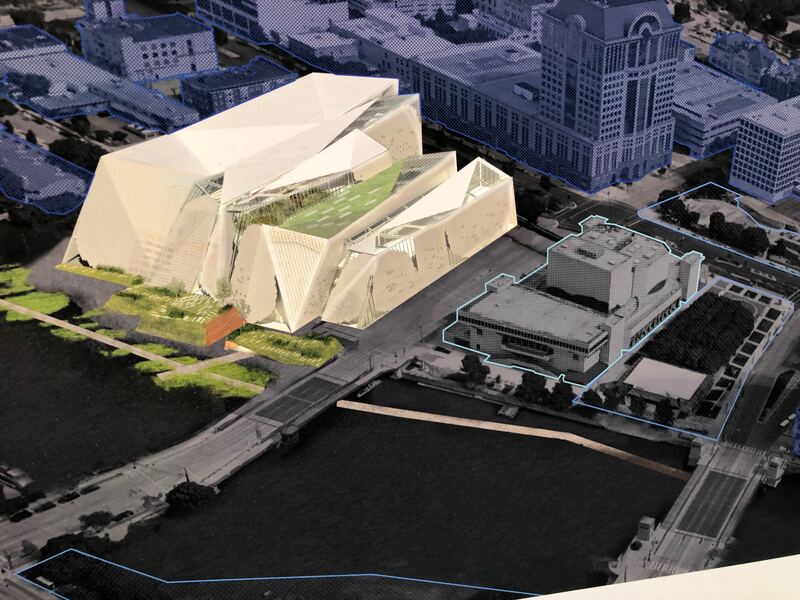 The public museum had previously released conceptual plans for a generic site, but has not selected an architect. Thank you for presenting this plan. 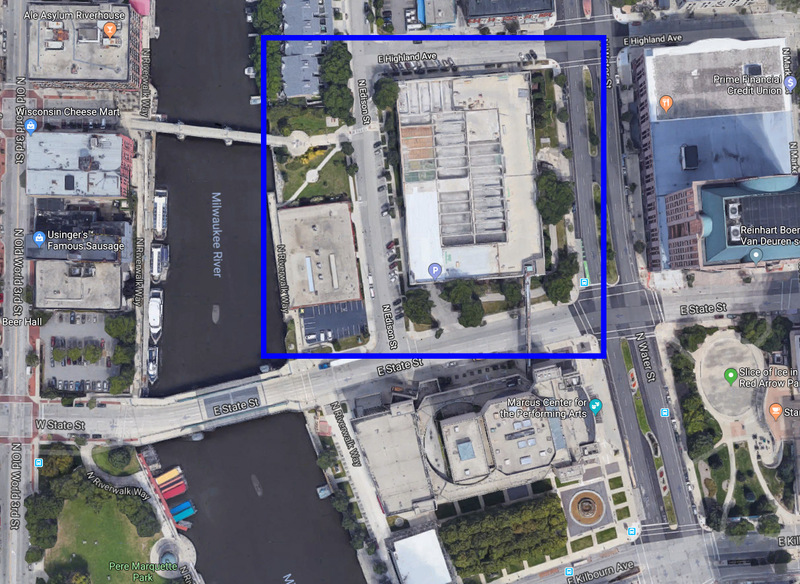 The site for Museum/Betty Brinn combined with a new parking facility for Marcus and jointly used by the museums is a very positive idea; This site makes more sense for the museum than the Mitchell Park study in my opinion. The Domes are worth preserving and should be an independent project. Claiming this river site and demolishing the parking garage is an improvement for the region, not a loss such as demolishing the Domes.